A4B is dedicated to improving the Marin mountain bike experience both now and for the future and we pursue that in a variety of ways including scholarships, grants and trail proposals. Check back often for updates on new projects and initiatives we are working on. We take seriously our role in stewardship and part of that is fostering future generations of engaged mountain bikers. We began a scholarship program to cover the cost for two NorCal High school Cycling League student-athletes to attend a week long Trail Stewardship Camp. Continuing with our commitment to the future of mountain biking in Marin (and beyond) we are proud to announce our A4B Youth Team/Club Grant program. Up to $2000 is available to mountain bike teams and clubs that complete the requirements! Access4Bikes works hard to protect the few trails we do have access to as well as to grow our opportunities. We thought it might be helpful for our members if we pulled back the curtain a bit and showed how we are advocating for you via submitting trail proposals to land managers. See some of our recent and upcoming proposals below. We know this trail has existed and been ridden by mountain bikers for decades and many, including A4B, didn’t think it should be significantly altered. So we worked very closely with MCOSD to fix a few erosive sections in a bike-friendly way but also to ensure the trail retained its technical character as much as possible. Have a look at some of the documents generated in the Hunt Camp proposal. As you’ll see, new mileage for mountain bikers in Marin doesn’t come easy. This is another social trail that’s been used for many years. A4B proposed its official adoption as an important singletrack option to gain access to San Geronimo Ridge. Our alignment also addressed several stream crossings and would substantially improve the trails environmental impact. 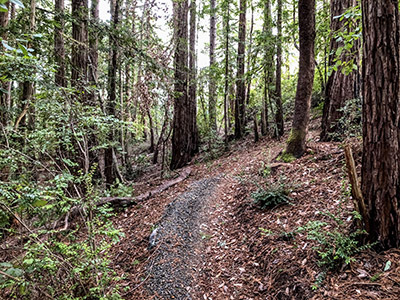 A lawsuit by Marin Audubon Society over potential impact from trail work and increased traffic to Northern Spotted Owl habitat has led to a temporary postponement to the opening of the Hunt Camp Extension trail. Part of the settlement stipulates a study period to review any impact to the NSO in the vicinity. We are currently working on a proposal for JCC with an alignment that does not exit onto private property and also provides a climbing route back to the top of San Pedro Ridge. Check back for more details. Let us know what trails you’d like to see opened to bikes. A4B worked closely with MCOS to retain as much of the original character of this trail as possible. We also played an instrumental role in creating the first in-sloped, bermed switchbacks on OS property!